Hello, everyone! I hope you are all enjoying the summer and having lot's of outdoor fun! I know in the summertime especially, it can be very difficult to make time for the gym or for working out. In a recent interview I was asked: What do you think are some of the biggest obstacles for people who are trying to get in shape? I think that the answer to this question varies from person to person, but one of the biggest things I hear most often is probably: TIME. Everybody is so busy trying to multitask and manage their lives and their families’ lives that just finding the time to work out or get to the gym can seem almost impossible. So, not enough time is the biggest excuse I hear. To the time issue I say this: I can appreciate and understand this problem. However, the bottom line is that we all make time for the things that we really want to do. If it means you have to get up at 4 o’clock in the morning to work out, then that is what you have to do. Think about this: if you do not make time to take care of yourself because of your familial obligations, you are really shooting yourself and your family in the foot. If you die early due to not taking care of yourself, who is going to take care of your family then? This may seem a little harsh, but it’s the plain and simple truth. You have to prioritize it into your lifestyle now. This is important if you want to be around for the long run for your loved ones’ sakes. You may need to get your significant other to work with you to make this happen. If you want this bad enough, you’ll figure out a way! No sugar-coating it. Just do it. They go to the gym and do a sub-par workout and get sub-par results and lose their motivation quickly and drop out. Or they hit the gym running and get overwhelmed and discouraged and drop out. This is why a good personal trainer is a great investment. They can motivate you, design an effective, safe, and structured workout specifically for your individual goals and needs, show you how to perform the exercises properly and give you accountability. You’ll be much more likely to be successful with a plan and some sound guidance. Another obstacle is money. Some people say that they cannot afford a gym membership or a personal trainer. I say, look at it as an investment in your health, happiness, future, and your family’s health, happiness, and future. That’s what it is. Now, if you truly cannot afford a trainer, then research it. Google it, buy a book, DVD, or whatever floats your boat. Look it up online. There is no shortage of information in today’s technology age. If you truly can’t afford a gym membership, you can set up a home gym for very little investment. You can do cardio outside or buy a piece of cardio equipment and a Swiss ball and a few hand-held weights along with some resistance bands and get a great home workout! Do some research and get busy. 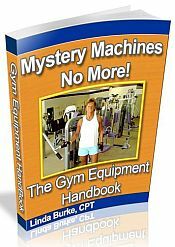 You can stock a home gym for a few measly bucks and begin to change your life today! Stop making excuses and just get moving! You can always contact me for help and suggestions. You know you want 'em...nice guns. Everybody does, so here's one of my favorite exercises for some real gun power, baby! Primary Muscle Group Worked: Biceps. This is truly one of the best ways to isolate those bi's like you've never been able to before. For a video demonstration of this exercise, click here and watch the very last exercise in the video. 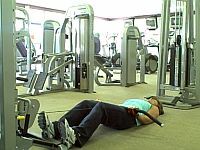 Preparation: Lie flat (supine) at the lower cable on the floor with knees slightly bent, keeping upper arms barely against the floor throughout the move. Grasp bar with underhand grip at hip width. Execution: Exhale as you curl bar as far as you can without moving upper arms from the floor and return to start position. Repeat for desired amount of reps.
1) Keep wrists straight throughout. 2) Keep upper arms barely in contact with floor throughout the exercise. 3) Keep a slight bend in the knees. HEREIN LIES THE CHALLENGE: Always, always, always go slow and controlled! Just when you think you cannot do another...do two more...in perfect form! The beauty here is that your back is supported by the floor, allowing complete and safe isolation of the biceps. Good luck and have fun growing those guns! If you are considering taking a risk, but are afraid for whatever reason, I encourage you to watch this video and think again. Don't give up. Persevere and don't be afraid to try. Think how different the world would be if any of the people in that video would have let those "failures" stop them. You never know what lies around the next corner or how close you are to your best success, unless you take the risk!